Students at SFB have a habit of taking chairs from classrooms and auditoriums outside to study in the gorgeous gardens around campus. It's awesome to see how studious everyone is, away from their laptops, and fully immersing themselves in their books, and it's also quite the sight to see so many desks in bizarre places around campus. However, exams have picked up this week, which means that more students have taken up this practice. So, when we showed up to class this morning, there were no chairs! We therefore had to move to a smaller classroom across campus, for today's session. 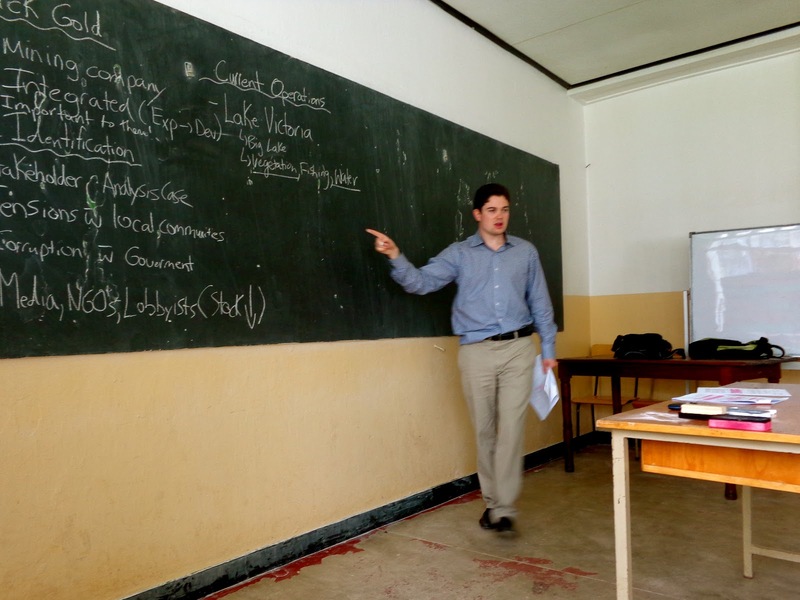 Jamie managed the change well and taught an interesting case, based on the Canadian company, Barrick Gold, and its issues surrounding a community near Lake Victoria in Tanzania. After a quick working session on campus, Aleena's family driver picked up Chris, Jamie and I from campus and took us to their home. I said it yesterday, but I'll say it again: it's so nice to be greeted by their familiar faces, it really does feel like a home away from home! Aleena and Samir then took the three of us into town, to tour the family business. As I wrote in my blog post yesterday, this place is an empire! 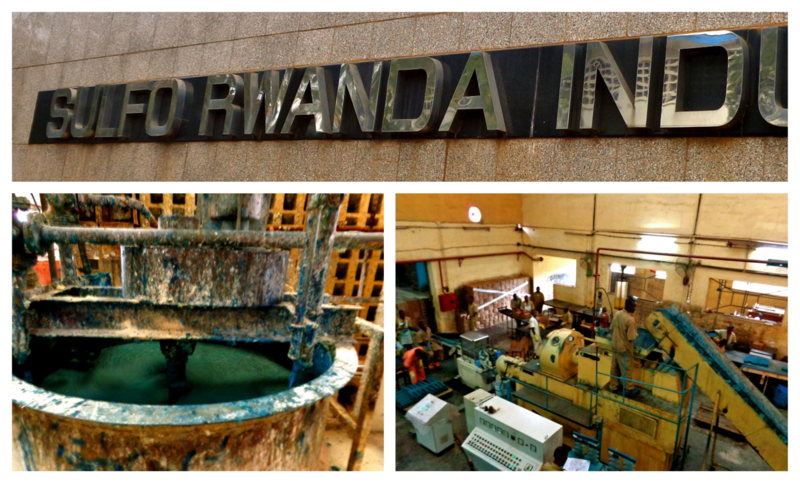 Sulfo Rwanda Industries are Rwanda's single largest employer, and they have an impressive track record of employee retention, as they are renowned for treating their employees superbly. We had the opportunity to meet with one of the senior managers, who showed us a quick presentation on the company, how Aleena's grandfather literally started with nothing, and how the business has transformed over the last fifty years to become one of the nation's prized homegrown companies. He took us into the plant, and we got to see the entire process flow of the soap bar production, including a massive machine that has been used since the 1970's! 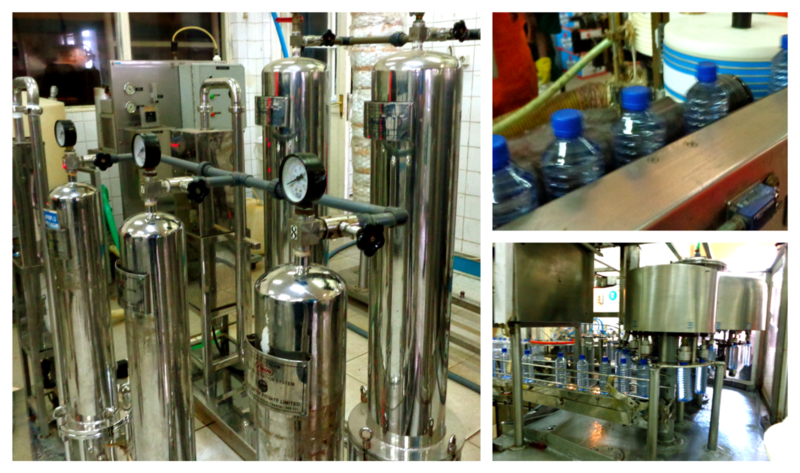 We then made our way into the water filtration and bottling facility, and it was SO COOL. From the little plastic tubes that are heated and blown up into various sizes of water bottles, to the high tech water filtration system, to the roller coaster that the bottles flow through to be filled, capped and labelled, I was in awe. I'm glad we've been drinking Nil all month, as we're now connected to the brand, and it really is of superior quality, surpassing the regulations in place. After our tour, we picked up Aleena's nieces, and made our way to Les Enfants de Dieu. This was another INCREDIBLE place. 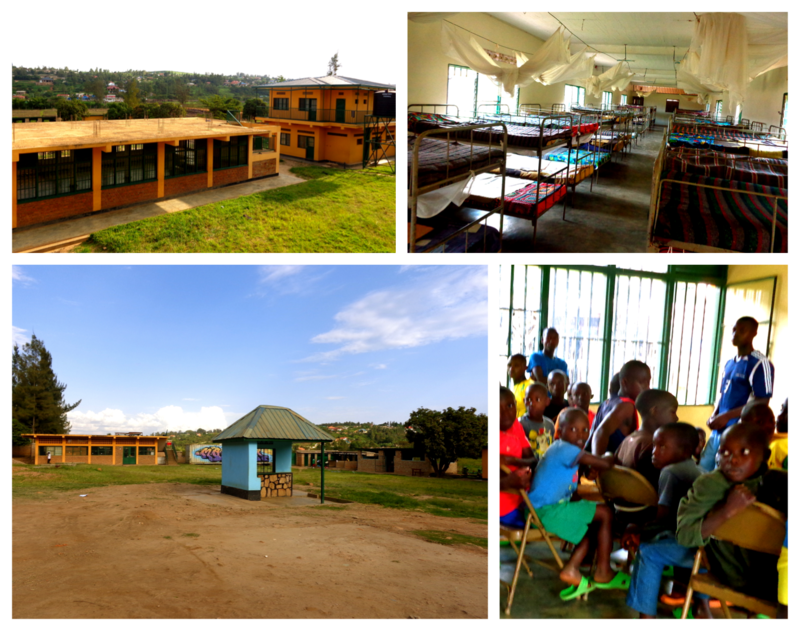 It's hard to describe, but essentially, it's an orphanage/rehabilitation centre for street kids. Not only does the facility house and feed the children, teach them life skills and provide them access to education, it teaches them responsibility, in a very unique manner. Les Enfants de Dieu is essentially run by the children themselves! The chief of staff, Rafiki, talked to us about the system that's been in place for about 11 years. Basically, there is a government, comprised of elected "Ministers" aged 15-18 who each run certain aspects of the management of the centre. The Ministers have committees of children and youth underneath them, and together they completely control their department. Ministries include finance, agriculture, recreation and others. Rafiki explained to us the initial hesitation by the staff to adopt the model, but then described how successful it has been for all parties, as it's all a system of control, and responsibility. The centre was started and continues to be run by Aleena's cousin, Faraz, and their grandfather, which made the whole story even cooler for us. Feeling quite inspired, we made our way home for our evening meeting, and said goodbye to Aleena and Samir. They went out of their way these last few days to make me feel like a part of the family, and I'm so very grateful for their generous nature and friendship. We did some work, and found out our meeting was rescheduled again to tomorrow! 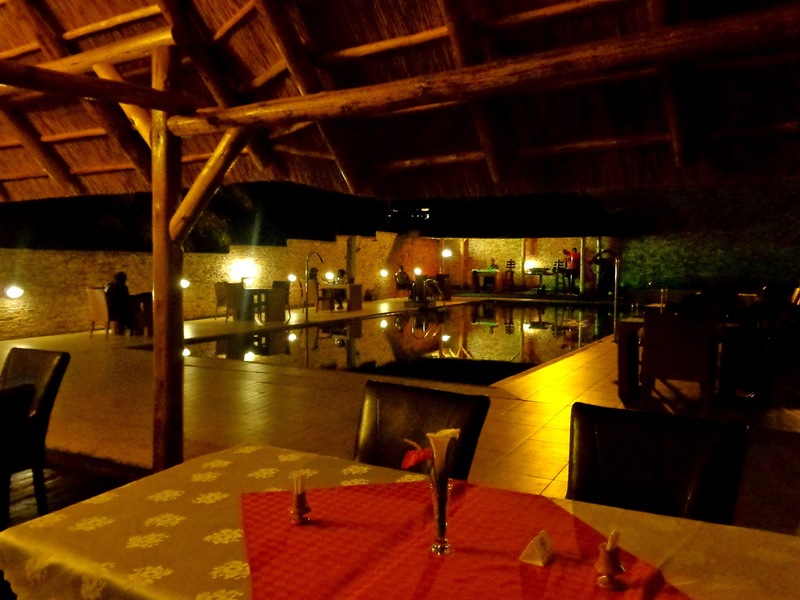 A tad frustrated, we decided to go into town to see Patrick playing at the Golden Hills Hotel. The restaurant was poolside and very posh, and he was great! The food was overpriced and not so filling, but other than that, we enjoyed listening to his band play, and had a lovely evening chatting with Alex's other friends who also joined us for dinner. After Patrick's set, two girls he's been translating for (another one of his many talents) arrived to say hello. They happened to be from Western University as well! They're here working with Western Heads East, and we were surprised to find out that they will be starting up a probiotic yogurt kitchen at Les Enfants de Dieu this summer! It really is such a small world, and we were all excited to share stories of our interactions with the wonderful orphanage. On our way back, we stopped at Nakumatt to pick up some snacks, and ran into another Western student shopping for groceries! He is here researching neuro-imaging in the hospitals, alongside another science student from Western. We were thrilled to have run into so many Mustangs today, and to learn about the wonderful things our school is doing here in Rwanda!